Send me a message and I’ll get back to you a.s.a.p! ORDER HERE! I am the Ukulele bandito and I play a selection of original stories, ballads and loves songs for lovers romantics and lovers of life. I like to rock out on occassion so I would call what I do Urban Folk. I like to write funny songs and touching sentimental stuff too because life needs to have both of those things! I also have a huge collection of covers songs spanning over 65 years of music history. If you need a song, soundtrack or video created for a special event, your business or creative project, send me a message! You can read more about the song by clicking HERE. 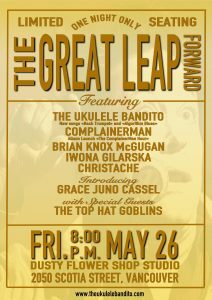 On May 26th I presented a live show Called “the Great Leap Forward” to celebrate the release of my next single “Algorithm Blues” AND the release of my newest album “The ComplainerMan Hour” featuring my band “ComplainerMan. Special guests included Iwona Gilarska, Christasche, and introduced Grace Juno Cassel in her first musical stage performance. Extra special guests were The Top Hat Goblins. We had a ball as we said goodbye to Vancouver and made our way across the ocean to more adventures. “I’m An Extra” – Available on iTunes! Available now on iTunes and all of your favourite music stores. Get yours from CD Baby today! This song is a tribute to all of those tireless, brave and inspired people who work as non union B.G. (Background Extras) on every film and television show that has ever been created. I shot this in my garage and edited it only when I was on sets waiting to be called into action. Some times I had a lot of time on my hands, other times didn’t. Sometimes it’s great to be on set and sometimes it’s not. I had this great chance to “work with” Robin Williams on his last movie “Night at the Museum 3”. He had always been a hero to me and I finally got to meet the man, quite by accident, by the tea truck. We spoke briefly and he listened to me play a short comic song on my ukulele that made him laugh. There was something about Robin Williams laughing at my joke that was incredibly satisfying. I was immeasurably sad when he left us. It is a moment I will always remember and a dram fulfilled. I will also remember that night, on an unnamed production, when I had to pretend that it was a warm spring evening and wear very little clothing when, in fact, it was just above freezing. The night was particularly memorable because there was also a light drizzle that was stabbing my face like a thousand miniature ice spears. The ground of the background holding had been immersed in water and mud from a storm earlier that day. In some places, in the main access ways, there were small lakes separated only by large pieces of plywood that one would have to jump over so as not to land in a sea of mucky uncertainty. It was impossible not to get mud on your clothes and shoes. The tent was being heated by only the smallest of gas heaters that could accommodate only 6 or seven of the 75 people who were working that night, which ended sometime around 3 am. Crafty (Craft Services) contained mostly donuts and cake which is like kryptonite to a background worker. Sure, you can eat celery and carrots too, but some sets, like “Girlfriends Guide to Divorce” put out fancy cheeses and fine crackers as well as an assortment of cold cuts and special desserts to make the Non Union extras feel really special. I think I gained a few pounds working on that show. No matter what, the conversations and personalities that populate Background Land always manage to provide enough stimulation, conversation and support to get us all through the long night shoots, the sun drenched day shoots and the short 4 hour shoots out in Langley. My first album “The Ukulele Bandito” is a collection of 16 songs that was dedicated to my daughter Grace Juno Cassel on the occassion of her 1st birthday. On the album you will find tracks full of hope, inspiration and laughter, some of despair and tragedy, others containing social commentary and a few lullabies that are sure to send anyone that listens to them into a dreamland slumber full of wonder. Custom Songs and Videos for Your Business! On this page you will find a selection of custom songs and videos that The Ukulele Bandito has created for fans all over the world. These songs are free for you to listen to. Some have been created for birthdays, some have been created for comedy shows, others for commercial websites. One song (Hey Ho, Hey Hey Ho) was commissioned by a guy in Singapore who wanted his own personal “feel good” song to get up to in the morning. There are all kinds of styles and they are all written and performed by me “The Ukulele Bandito”. If you want to have the Ukulele Bandito write you your own personal song, contact me directly. Songs and Videos for Kids! I’m a Dad and so I find myself naturally drawn to creating songs and videos for my daughter to help her learn all the things she needs to know. Contact me about your special project and let’s make some magic together! This playlist will give you an idea of what I have made so far. Lots more coming soon! I have created many voices and done narration on a wide selection of audio projects Listen to this playlist to hear my range and vocal quality. I love creating really short jingles and theme songs and drops for podcasts and radio. I enjoy writing comedy and can always come up with an entertaining set of lyrics for your special short project. Get your 15 second them for $5. Give the gift of “Bandito-Gram” delivered by the Bandito himself! If you live or work in the Metropolitan Vancouver area, call me on 778 – 888 6166 to order your very own singing telegram. I can create, rehearse and deliver your special message, in song, live and give an mp3 version to the guest of honor after the performance for under $250. The cost of “Bandito-grams” is determined by the length and content of the song and/or performance. If you are not Vancouver, call me anyway, I like to travel and will be the perfect addtion to your special event no matter what it happens to be. “The Ukulele Bandito Hour” is my live show featuring a selection of original songs, cover versions, hat tricks, some ukulele juggling and comic madness. I improvise songs about the people or the situation and generally provide a great time for everyone. I am a great host and emcee and can oversee your staged event both on stage and behind the scenes as your special event coordinator. Call me to discuss your event, I have played around the world at festivals, corporate events, parties, living rooms, weddings, and backyards.